St. Martin's Paperbacks, 9780312997281, 320pp. Harvard professor Wilson Chaney's position in life is hanging by a thread; his marriage, his reputation, not to mention his tenure at Harvard are in the hands of a blackmailer, someone threatening to sell Chaney's secrets at very high prices. His enviable life could disappear into thin air should the blackmailer's evidence - proof of his affair with a young student - become public knowledge. So he hires Boston private investigator Carlotta Carlyle to track down the blackmailer and put a stop to the scheme. Can she do it? Of course, but should she? The professor doesn't inspire much loyalty-after all, he did commit adultery with one of his own students-but Carlotta agrees. Digging into the case, nosing around Harvard and the possible suspects from the rest of Dr. Chaney's life, she uncovers a suspicious death as part of the backstory to Dr. Chaney's situation. Suddenly Carlotta's sixth sense is telling her the case might be more complicated-and more dangerous-than it first seemed. Fresh from the success of The Big Dig, the masterful Linda Barnes delivers a bold and engaging novel infused with the deft touch and intricate suspense that have become her trademarks. 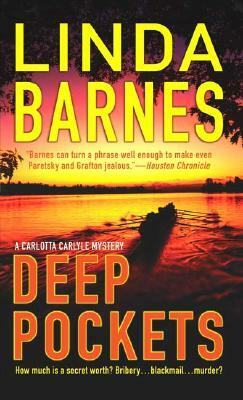 Linda Barnes is the author of nine previous Carlotta Carlyle mysteries and winner of the Anthony and American Mystery Awards. She lives in the Boston area with her husband and son. "Her first person prose is well-honed, and her touch is sure enough to float her fast-paced narrative while still allowing for sharp development of an intriguing cast of characters...best of all, Barnes can turn a phrase well enough to make even Paretsky and Grafton jealous." "No question: Carlotta's tenth case is her best to date. Edgar nominators, take note."